In my first post, I argued that the evolution of the book would produce abundance and variety. 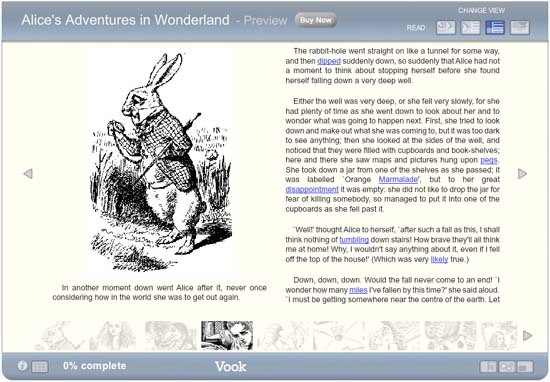 A tremendous case in point is the growing number of versions of Alice in Wonderland available, each of which offers its own unique experience. 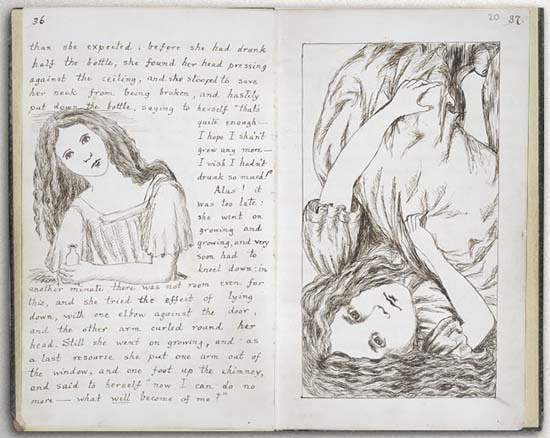 First up, The British Library has made Lewis Carroll’s original manuscript (titled Alice’s Adventures Underground) available to view in its entirety online as part of its virtual books project. The content is fantastic: scans of all 91 hand-written pages, complete with Carroll’s own illustrations, along with a transcription and audio recording. It’s a great research tool, but the presentation – and therefore the reading experience – leaves something to be desired. The Adobe Shockwave plugin allows viewing with a rather awkward page-turning animation. The alternative is to view each page as an individual jpeg. Unfortunately the site layout means that one cannot click directly from one to the next at legible size. Next we have the Vook edition. 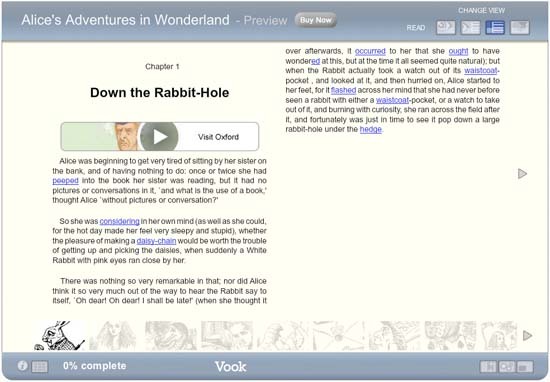 Vook’s stock in trade is ebooks with multimedia enhancements. In this case, we have the text of the published version (Alice’s Adventures in Wonderland), including John Tenniel’s illustrations, along with some supplementary video segments. I’m not a huge fan of the Vook approach – the illustrations are poorly presented, the video feels intrusive and the text is littered with distracting underlined links pointing to word definitions at various different external sites1. A good reminder that evolution does not necessarily mean improvement. A far more inventive and enticing multimedia edition is this one from Atomic Antelope. 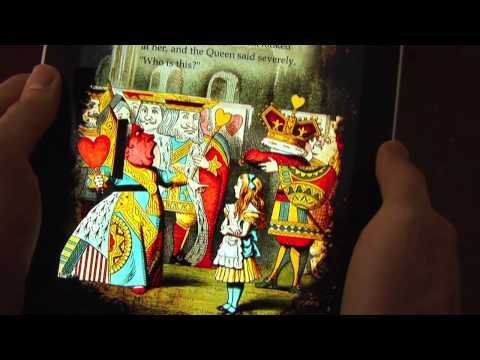 Bringing colour and movement to Tenniel’s illustrations, the app also uses the interactive capabilities of the iPad to create an experience unique to that platform. Speaking of editions that make the most of their form, this entry in Penguin’s clothbound classics range is a fine example of the continued vitality of the printed book. Coralie Bickford-Smith’s design is a celebration of the book as physical object2. So, we have variety of products, at a variety of prices. The British Library scans are free to view. The Vook costs $1.99 for iPad and iPhone (£1.29 and £1.79 respectively in the UK app store), and $2.99 for an online version. Atomic Antelope’s Alice for the iPad is £5.49/$9, and has a free ‘lite’ version. 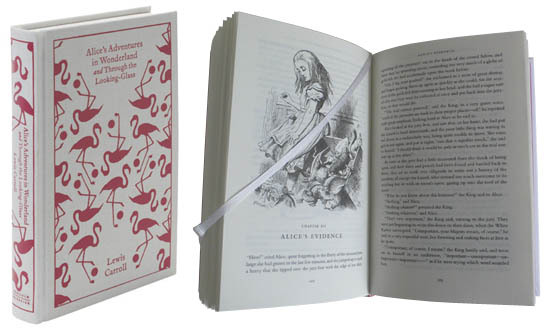 Penguin’s clothbound classic is priced at £12.99/$20.00. And all this some 146 years after Carroll first committed his story to paper.